WASHINGTON (Reuters) – President Donald Trump on Tuesday signed an order to undo Obama-era regulations to curb climate change, keeping a campaign promise to support the coal industry while calling into question U.S. support for an international deal to fight global warming. 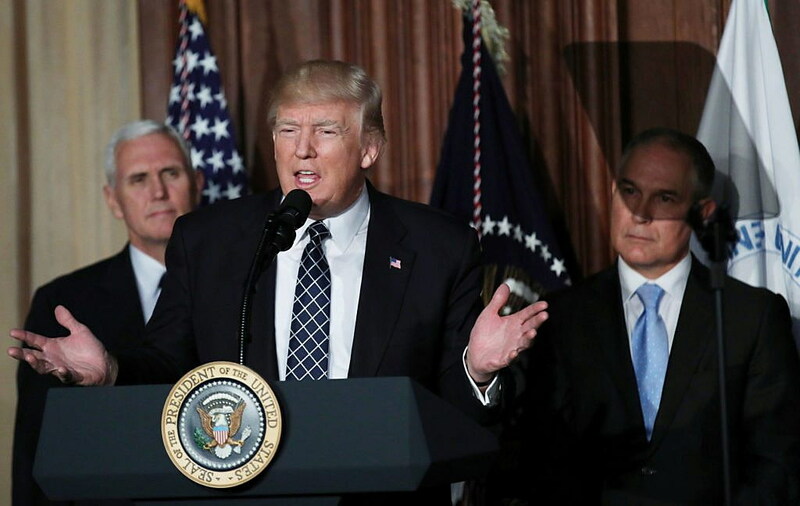 Flanked by coal miners, Trump enacted his “Energy Independence” executive order at the Environmental Protection Agency. A coalition of 23 states and local governments vowed to fight the order in court, though Sen. Steve Daines, R-Montana, supported the move. Trump’s decree also reverses a ban on coal leasing on federal lands, undoes rules to curb methane emissions from oil and gas production and reduces the weight of climate change and carbon emissions in policy and infrastructure permitting decisions. Carbon dioxide and methane are two of the main greenhouse gases blamed by scientists for heating the earth. The wide-ranging order is the boldest yet in Trump’s broader push to cut environmental regulation to revive the drilling and mining industries, a promise he made repeatedly during the 2016 presidential campaign. Energy analysts and executives have questioned whether the moves will have a big effect on their industries, and environmentalists have called them reckless. Environmental groups hurled scorn on Trump’s order, arguing it was dangerous and went against the broader global trend toward cleaner energy technologies. “These actions are an assault on American values and they endanger the health, safety and prosperity of every American,” said billionaire environmental activist Tom Steyer, the head of activist group NextGen Climate. Green group Earthjustice was one of many organizations that said it will fight the order both in and out of court. “This order ignores the law and scientific reality,” said its president, Trip Van Noppen. Trump’s order also lifts the Interior Department’s Bureau of Land Management’s temporary ban on coal leasing on federal property put in place by Obama in 2016 as part of a review to study the program’s impact on climate change and ensure royalty revenues were fair to taxpayers.